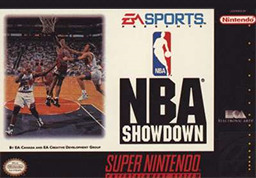 NBA Showdown for Super Nintendo allows you to choose from all 27 teams, with complete rosters from the 1993 season. Get into the action with a single game, full season, or playoff match-up. You can also trade players with the rest of the league. After hitting the court, keep an eye out for injuries, and make sure to substitute tired players.